Authors: V. van Eylen et al. “A new exoplanet has been detected.” While this message would have triggered tremendous excitement among astronomers a few years ago, it speaks for the huge success of exoplanetary detections that by today the message has become daily news. In this respect, the result of today’s article is nothing special: Yet another detection of an exoplanet. Nevertheless, this detection is worthy of being featured on astrobites because the detected exoplanet K2-39b seems to be exceptional. What makes it special is the fact that this planet orbits an old star on at the smallest distance ever observed so far. The orbital period is only 4.6 days. The host star is supposed to be old relative to its mass. The later stage of evolution implies that the star has a larger radius. Therefore the planet orbits the star at a remarkably small distance of only four times the stellar radius. A common interpretation of the lacking exoplanets around late-stage stars is that planets cannot survive at small orbits because they are disrupted by the host star. The question now is: What can explain this detection? There is no definite answer to this question yet, but let’s briefly look at probable explanations. One possibility is that the authors were just very lucky in observing a planet that will be destroyed very soon. However, the authors point out that disruption of such a planet around a sub-giant is expected to occur in about 10 kyr. Considering stellar timescales are on the order of a billion years, it is very improbable to detect a planet in the danger zone, unless the planet is not in danger of being disrupted. Rather than being caused by tidal disruptions, the small number of short-period planets could result from massive planets forming less frequently on small orbits around heavier stars. An explanation for the latter could be that due to the faster evolution around massive stars, there is less time to form planets in the corresponding protoplanetary disks. However, the explanation for their detection could also be of different origin. Maybe the star is in fact not at such a late stage of evolution as believed. 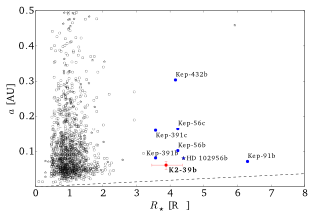 Astronomers typically observe the luminosity and the effective temperature of a star and compare the values to the evolution track on a Hertzsprung-Russel (HR) diagram. This allows to determine the age. In general, it is fine and great to explain the evolution of a star as the evolution in the HR-diagram, but keep in mind that the evolution may in fact deviate to some extend from an idealized model. Yet another possibility for the detection could be that the planet was in fact much smaller in the past and became much larger during the post main sequence stage. Technically speaking, the planet may have inflated due to its own radiation – though the authors consider this possibility as being unlikely for a 50 Earth mass planet at such a small orbit. Either way, to find a definite answer, further observations are required. The top part says 8 Earth masses (and 50 Earth radii); the bottom says 50 Earth masses.